This unit was very comfortable, well equipped and easy to come and go to everything on the island. Island Retreat provided an excellent vacation for our family of 6 adults and 6 children from 15 - 2 yr. of age. The accommodations and layout worked very well especially since the weather was cool & rainy and we were inside more than we had hoped. The only negative was that there was no stand-alone shower for my husband who has mobility issues & uses a walker--4 tubs. However, the house itself was accessible. Would recommend that the private Master suite have raised toilet and handrails. We have stayed at Island Retreat before.Some of the same problems that we observed before were still present. Chairs in dinning room and breakfast area very unstable.Fridge door in kitchen worn out and light visable when closed. Fridge in separate quarters moans and groans and will disturb service was a bust on this reception half the time.Too many problems for top dollar rental.We like Island Retreat but might rethink staying there again. The wife, myself and two children and six grandchildren have stayed two years in a row, at Island Retreat. It is reasonably priced and accommodates our whole family easily! It has enough bedrooms and bathrooms to make it comfortable! It is located only about three houses from the Beach walk across. Plus, it is on a large corner lot, with enough parking spots for us as well! It does need larger TV's in the bedrooms, to make it better. Thanks to Jekyll Island Realty for helping us with this wonderful retreat home! we have already booked it for our 2018 Vacation! Thanks Guy's! We took our 7 children (biological, in-law, and foster) along with my parents. This house was perfect because my parents stayed in the separate space while my husband and I had the room between the kitchen and living room. Our kids all all stayed in the closed off hallway with 3 bedrooms. We had room for privacy and it was just a short walk to the beach or drive to the others. GO DAWGS!! Maybe next year!! Always a pleasure to visit Jekyll Island. Our rental was great and all we expected.We have been visiting for years and intend to continue. We feel safe there and appreciate the law enforcement presence there.They do a great job. Some of furniture needs replacing. We have been renting from Jekyll Island Realty for 17 years...excellent, professional care each time! We stayed at The Island Retreat with a total of 18 family members, from 8 months old to 60. We had a blast. The home is fine, plenty of room, good location, great for extended family. The grandparents used the in law suite and it worked well. Keep in mind that the closest beach is a low tide beach and there are a lot of rocks about 30 yds out that are a problem at low tide. We actually found that just after high tide was best. And a great beach is a mile down the road. The outdoor patio area w/ a shower was used a lot. Nice deck chairs, btw. Nice time for all of us. Great Getaway House for Large Families, Near the Beach too! We found this large House last year & decided to try it this year. We have been coming to Jekyll for over 30 years now! This is a really good deal, for the size house you get. It is right in the Heart of Jekyll's Hot Spot & Beach Area! 5 Large bedrooms, plenty of bathrooms and 3 Master Suites! 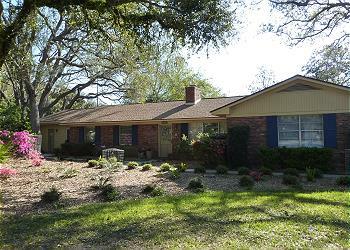 We have already booked this House, a year in advance, for our next trip to Jekyll Island. Huge Private Master Suite just steps away from the main House is huge & very quiet! Great for anyone! Be sure to make the short drive to Darien, Ga; to enjoy Seafood at Skipper's Restaurant, on the Darien River! Great Food, Drinks & just a short 30 minute drive from Brunswick! Jekyll Realty is also a Great Company to work with! Thanks Guy's for our Awesome Vacation! We'll be back! Jekyl has everything and so did "Island Retreat". Last year was the first time our family had went to Jekyl. We loved it. We tried to get the same house, but it wasn't available. Island Retreat was amazing. Bright, cheery and fully stocked. There were even a couple of bike they let us use. The kitchen was stocked and even had a nice spice rack full of spices. Three tables to feed a crowd or just play games. This year we took family and a few employees and we fished, golfed, cooked and played games. We loved this house. We will rent it again. It was perfect! 10% discount special for all new bookings for May 2019. Discount already applied to displayed rate.